If you want to spend your holiday in a camping, surrended by the nature and few steps from the sea, but you don't want to give up to the facilities from the holiday village, Spiaggia Lunga is your place! We have pitches for tents, caravans and campers. The camping area extends along the entire Sea Area, on one of the most beautiful stretches of the Santa Maria di Merino Bay in Vieste. 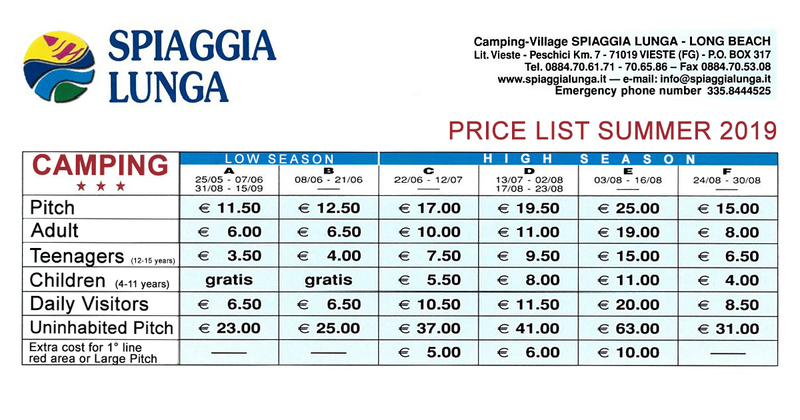 At the Camping Village Spiaggia Lunga you can enjoy your holiday in a large shaded pitches a few steps from the sea, a lot of toilets blocks with free hot showers, laundromat and the possibility of using all the other services the Village offers. The village is divided into two areas connected by a free shuttle service. In the Sea Area where the camping is, there are also: three bars, a bakery, the supermarket, a restaurant-pizzeria and a fish-restaurant, the fast food Panini di Mare, playground and swimming pool for children, beach volley court , Kite and windsurf school. The Hill Area is the village greenest area, there you can find: two bars, two swimming pools, the mini-golf course, the bowling alley, a basketball court, 3 lighted tennis courts, 4 short-tennis courts and the wellness path. Come to live your dream holiday on the Gargano! Excluded Children under the age of 14 and the Disabled and their carers. Prices are per day and include electricity, parking (second car € 5,00 per day), hot showers, use of swimming pool and entertainments. Prices do not include use of tennis (€ 5,00 per hour). PAYMENT: Credit cards accepted: VISA, CARTASI, BANCOMAT, DINERS, AMEX). Cheques not accepted.